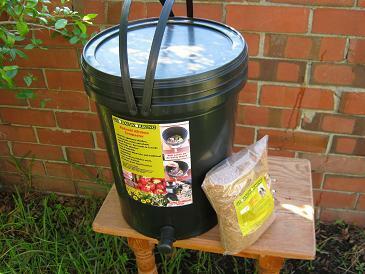 converts them into a product that can quickly be composted and used as a great soil conditioner. This recycling method originated in Japan and the word actually means "fermented organic matter!" It is often referred to as a composting process which is actually not entirely correct. But there are similarities between both recycling practices. Both processes help us to prevent organic materials from rotting on landfill sites and return their nutrients back to the soil. But while composting is an aerobic process that heats up the kitchen and garden scraps in large piles to up to 80 degrees C / 176 degrees F, bokashie ferments the organic waste anaerobically at much lower temperatures in specially designed buckets. A bucket for fermenting kitchen scraps with bran. It recycles all your kitchen waste, even meat, dairy products and fish. It produces a great liquid fertilizer that can as well be used to clean septic tanks and unblock clogged dreains. This bran makes it all happen. So how does it actually work? That's the beauty it is really as easy as child's play. -some bran that has been enhanced with EM's (effective microorganisms). 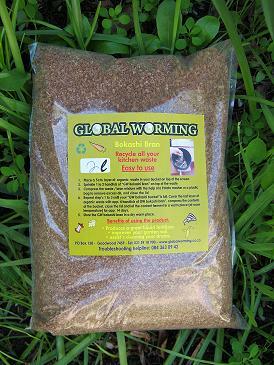 Both products are available at many Eco shops and worm composting bin suppliers.If you do some research you can even make them yourself to save some costs. Repeat step’s 1 to 3 until your “bucket” is full. Cover the last layer of organic waste with app. 4 handfuls of "bran”, compress the contents of the bucket, close the lid and let the content ferment in a warm place (at room temperature) for app. 14 days. When you open your bucket after 14 days, the contents will be fermented and should look and smell like sweet and sour pickles. You might see as well a fine white fungus on the surface of your processed waste. This is a good sign and a clear indication that the process was successful. Wash the “bucket” after each use with clean water and start the process again. that gets dumped on landfill sites. The fully processed contents of your bucket can as well be added to a worm bin or a compost heap. Note: Even dog poop can be recycled with this method without problems! "Return from "bokashi" to the "home page!" "How to make Compost tea." How to use bokashi juice to clear a clogged drain. "How to start a worm compost bin"
Diese Seite in Deutsch lesen!